I love kitsch. I love non-chain bars and restaurants with themes. I love super boozy drinks. So when I heard about the newly opened tiki bar on West 25th called Porco Lounge and Tiki Room, I made a beeline for the place. Located far, far away (or at least it seemed that way) from the Ohio City hot spots, Porco Lounge is an alcohol fueled oasis in the middle of dilapidated buildings. But because Porco isn't in the middle of the main strip in Ohio City, it does have one thing that a lot of other places don't - a parking lot. (yes, it's small, but it's something) My boyfriend and I walked from the West Side Market's parking lot on Monday evening around happy hour. Maybe 6-ish? I wouldn't suggest doing that after dark. It was a longer walk than we expected (and we're runners, so I'm not complaining about the distance), and the area seemed a little...run down? So I'd say it's well worth the 5 minute drive versus the 10 minute walk. But that's just me. I didn't quite know what to expect when we walked in, but after walking through a hanging curtain of wine corks, we were transported into a warm, tropical feeling environment. The bar tenders were friendly but not too friendly. And the decor was very tiki, but no so tiki that it seemed like you were at some awfully slapped together chain restaurant. For a Monday night, the place was pretty packed. I expected to be one of the only patrons, but there was a solid crowd drinking and eating. There's a regular dining area with some dark nooks and crannies and a more well lit bar area. I love chatting up bar tenders, so we took a spot at the bar. We looked at a drink menu and marveled at the number of drink options available. Like all fine drinking establishments, there are no bottled syrups. No flavorless garnishes. Every ingredient in every drink is freshly made (or sourced) and is in there for a reason. This ain't your momma's daiquiri. Think Velvet Tango Room of tiki. Making drinks is an art and the folks at Porco do it right. I ordered a zombie. Mainly because it was advertised as being so strong that they have a 2 zombie maximum per person per night. Bazinga. My boyfriend went the safer route. He got a hurricane. I thought both drinks were good, but I liked mine better. Because of the subtle layers of booze it contained, and because there was dry ice in it when it was served to me and it bubbled like a cauldron. Neat! We had dinner plans otherwise I would have tried some of the vegetarian but easily vegan-ize-able black bean tacos that were on the menu. Our bartender was telling us that the food menu is a work in progress, and they're trying to find the best mix of foods for the bar. 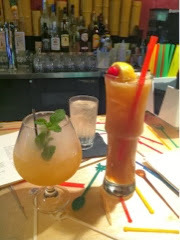 Their goal is to sell fantastic tiki drinks, so don't expect to get the best meal of your life. But...from the plates I saw coming out of the kitchen, I think you can expect to get some solid small plates. I love going to "theme" bars when I'm traveling for work...but I really haven't been to all that many theme bars in Cleveland. Where's your favorite unique place to get your drink on? While we are honored to be mentioned in the same sentence as the Velvet Tango Room, we have some years to establish the standard that has been set there. Paulius has done an incredible job in creating a true "craft cocktail" movement, not only locally, but on a nationally recognizable level years before is was fashionable. The VTR was (and to some degree still is) off the beaten path, which served as inspiration and courage to us that if you build it, and do it right, they will come. We will continue and strive to provide as close of a cocktail experience in terms of quality product and service that Paulius and the VTR has done for the past 17 years. VTR is a friend, a mentor, and an inspiration to what exactly an amazing, proper cocktail can be. To that end, we are humbled by the response thus far, and are always looking to improve towards that goal. We ask for any input, good or bad, so we may apply it towards being the best possible experience for our guests. Thanks again for the kind words, and we hope to see you again someday! Cheers!